There are two types of people in the world: those who sleep under a comforter and those who sleep under a duvet. The difference? You probably can’t tell and you're definitely not the only one. The duvet vs comforter debacle is old and often confusing. Both go on top of your bed, both keep you warm and cozy at night, but both also have defining aspects that are important to consider before choosing your bedding. So let’s get right into it! Typically, a comforter is a thick, lofty blanket filled with down (the fine, fluffy feathers of ducks and geese) or synthetic fibers. It is quilted or stitched to keep the filling in place and make sure it’s distributed evenly. Comforters go on top of a top sheet and are NOT supposed to be put inside a cover — they’re a standalone piece of your bed linens and are often made of fashion fabric that is patterned or colored. They can be followed by a blanket, a quilt or a throw for extra warmth. Comforters can be easily washed with other bedding. 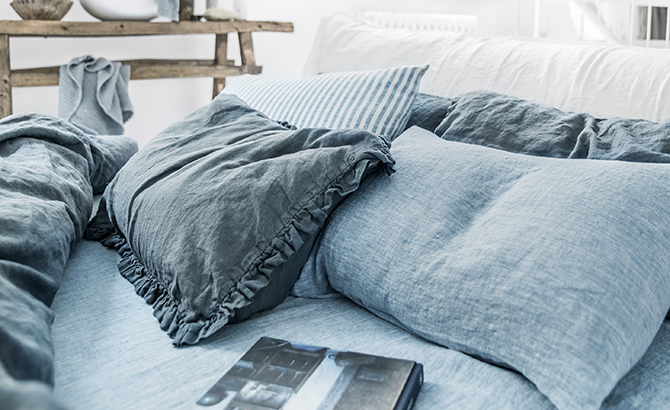 A duvet is also a fluffy blanket filled with down, wool or synthetic fibers. In some parts of the world, it is called a “comforter” adding to the confusion. However, the word “duvet” refers to the insert that is sold separately from duvet covers and other bed linens. This is the main difference between a comforter and a duvet — the former is a standalone piece while the latter is designed to be used with protective covers. However, duvets remove the need for additional layering with top sheets, quilts, blankets, and throws. Duvets should be dry-cleaned to ensure the filling doesn’t get lumpy. 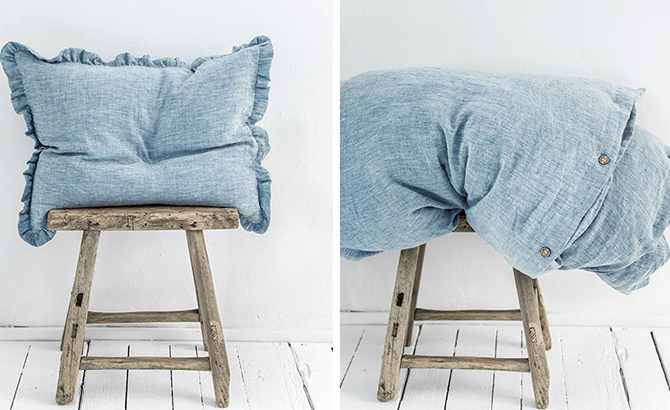 A duvet cover is to a duvet what a pillowcase is to a pillow. It’s the protective cover that encases your duvet keeping it clean. Duvet covers are removable and can be easily swapped when you want to wash them or simply change the mood of your bedroom. They come in many different colors, patterns, and can have other decorative details such as pom pom or ruffled trim. • Do you like spending time making the bed? If you do, comforters are your item of choice because they are typically used with corresponding bed linens: flat sheets, top sheets, blankets, throws, etc. If you hate making your bed, go with a duvet and a duvet cover which will save you time and stress. • Do you enjoy fluffiness? Duvets are fluffier than comforters and because they can be used alone without additional sheets, they are not as confining. Comforters are generally less plush, they are heavier and tend to go flat quicker. 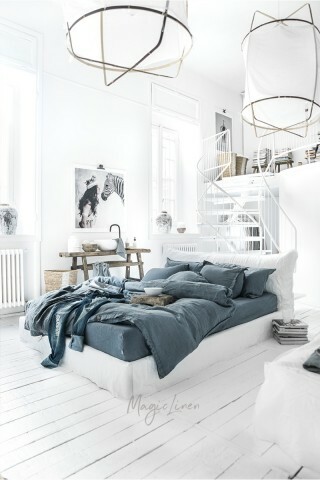 • Do you want to give your bed a layered look? Go with a comforter as it can be paired with corresponding bed linens such as flat sheets, top sheets, blankets, throws, etc. • Do you want to be able to wash it at home? 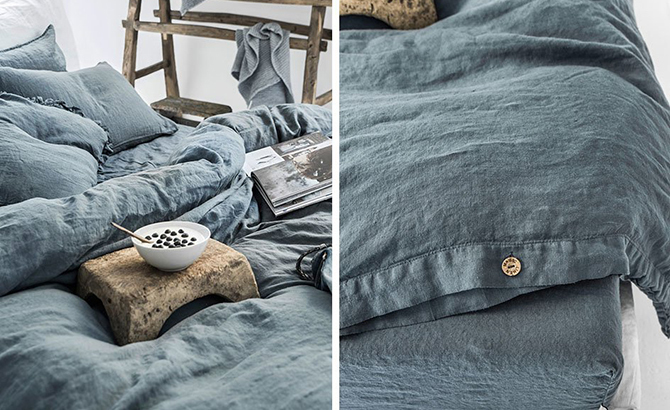 A comforter can be easily washed with other bedding so that’s an obvious choice right here. 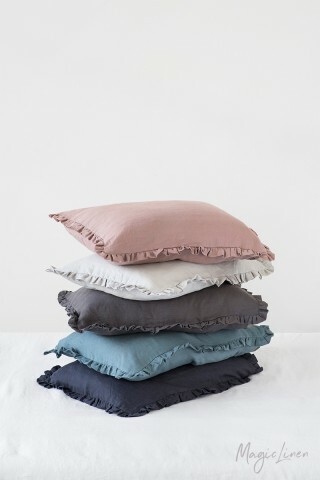 On the other hand, duvets don’t need to be washed as often because they don’t have direct contact with your skin — all you have to do is make sure to change the duvet cover every two weeks or so. • Do you toss and turn a lot during sleep? A comforter being a standalone item is more likely to stay in place compared to a duvet, which can twist inside the duvet cover. • Do you like switching up the style of your bedroom? Those who like to match their beds to the season or their moods should go with duvets. All you’ll have to do is change the duvet cover instead of investing in multiple comforters. Duvet covers can be bought separately or in sets with bed sheets and pillowcases.